Until the youngest of our two children went away to college, my primary job was raising our "third-culture kids"*. Moving from country to country, I observed other mothers in action and was quite often struck by the cultural differences in parenting. In Switzerland, my doctor, midwife and friends advised me to put our firstborn on a strict schedule. Following their instructions, Sara ate, slept and played according to the clock, just like a good Swiss child. However, when we moved to the Philippines and had live-in household help, the normally acquiescent Filipino women argued that leaving our infant son in a room on his own was akin to child abuse. In their culture, where collectivism is valued over individualism, babies sleep next to their mothers and their needs are met immediately. Rather than looking at a clock to see if it was time to feed Philippe, Virgie and Viola urged me to be guided by his needs. Watching and learning from my internationally diverse group of friends has convinced me that we parent our children according to what's culturally important to us. So, when I heard that Pamela Druckerman would be speaking at the American Library about her new book, Bringing Up Bébé, I marked the date in red on my calendar, not because I plan to raise another child in Paris but because I hoped that she would provide some insightful clues as to what's most important to the French. I wasn't disappointed. 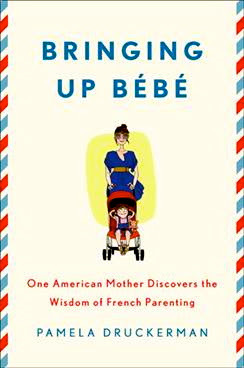 While Druckerman, who has been overwhelmed by both the positive and negative reactions to her book, says that Bringing Up Bébé is more of a memoir than a manifesto, it's pretty clear that she's convinced that French mothers are on to something good. Saying that she has been transformed as a parent by living in France, Druckerman explained that there are four magic words in French: bonjour (hello), au revoir (goodbye), merci (thank you) and s'il vous plaît (please). According to the author, the French idea is that by making children, even those as young as one, say "hello" when they meet someone ensures that kids learn that the world doesn't revolve around them. In fact, the idea that babies and small children are rational beings and should be treated accordingly permeates Druckerman's anecdotes. She explained that while French mothers don't specifically teach their young children patience, there are ongoing lessons about how to delay gratification. Druckermann, who used to inhabit a world where moms carry a constant supply of Cheerios in Ziploc bags, was initially amazed that French children are able to wait for their goûter, the official snack time around 4:00 pm. As almost all of my parenting years were spent abroad, I was surprised to hear Druckerman's descriptions of the intense "Mommy Wars" in the United States that pit working mothers against those who stay at home. According to the author, there isn't the same sort of competition between mothers in France because almost all of them put their babies in daycare and happily return to work at the end of their maternity leave. When Druckerman asserted that French women can technically have it all because there isn't the same sort of social pressure to stay at home, I found myself thinking of a recent article in the New York Times where Valérie Toranian, editor-in-chief of Elle magazine in France, said that French woman are exhausted. Sound familiar? Well, apparently it's even more difficult when you're expected to work, cook a delicious dinner, look immaculate in stiletto heels and raise children who say bonjour to everyone. When I questioned Druckerman during the book signing session as to her thoughts on why French women are the largest consumers of anti-depressants in Europe, she responded that it's because they're so inexpensive in France before adding that she's frequently asked this question and hopes to address it in her next book. While I'm relieved that NBC's Today Show segment about Bringing Up Bébé wasn't my first introduction to Pamela Druckerman because I found myself more interested as to why she was wearing a black beret in her apartment in Paris than in what she was saying, she made many excellent points during her talk at the American Library. Appearing sans beret, Druckerman was less of a polarizing Francophile and more of a mother trying to figure out how to best raise her children in a foreign land. As another mother, I applaud her efforts. What do you think? Can we learn something from the French about rearing children? It's not only the Anglophones who are interested in Druckerman's book. A camera crew from the German television channel ZDF filmed her talk last night. Please click here to read Elaine Sciolino's review of Bringing Up Bébé in The New York Times. *Third culture kids - A third culture kid is a person who has spent a significant part of his or her developmental years outside their parents’ culture. The third culture kid builds relationships to all the cultures, while not having full ownership in any. Although elements from each culture are assimilated into the third culture kid’s life experience, the sense of belonging is in relationship to others of the same background, other TCKs. Pamela Druckerman attracted the largest audience that I've seen at the American Library. Interestingly enough, the crowd was very diverse - young, old, middle-aged, men, women, Americans, French. Please let me know if you get any information about when the segment will air on ZDF. I would really like to watch it. I didn't take photos of the crowd because of the French privacy laws, although come to think of it the head of the library mentioned that anyone who didn't want to be on the ZDF program should just stay out of the way of the camera so I guess that it would have been alright if I would have taken the same shots as the cameraman. As a health professional and also a grandmother, I found this fascinating. My daughters and DIL's were overwhelmed with childcare books and advice form "professionals" who advocated everything from strict regimes and "controlled crying" to the continuum concept, where the baby is continually carried around by the carer. So imagine the poor grandma, who has to babysit but respect the parents views and treat each child differently according to the latest book the mother had read. The happiest and most confident mother , of these daughters, was the one who never read a book, bottle fed and put the baby in it's own room from the word go!..and went back to work after six months because she was poor and had no choice. "Mummy wars" go on in the UK too. A modern woman really is bombarded with conflicts which she will never resolve until the child is grown and she can take credit or guilt for the way the child turns out. At the end of the day we all just do our best and hope it turns out OK! Oh my goodness, Denise, I hadn't even thought what all of the new parenting books mean for the poor grandparents! Thinking back, I hope that my mother didn't think that I was insufferable when my children were born! As you already know, much of this new mommy behavior probably stems from insecurity and downright fear of being responsible for these tiny human beings. As far as taking the credit or the guilt for the way things turn out, after my daughter read this post she contacted me on Skype and said that she hadn't realized that she was on such a strict schedule when she was a child. When she went on to say that it explains a lot of things, I jokingly said, "Oh, sure! Blame your mother!" And just to give you a heads up, Mrs. Druckerman said that there is a new book coming out about how Eskimos raise their children! In the UK, Pamela Druckerman's book is called, "French Children Don't Throw Food: Parenting secrets from France. I'm glad you went to this. 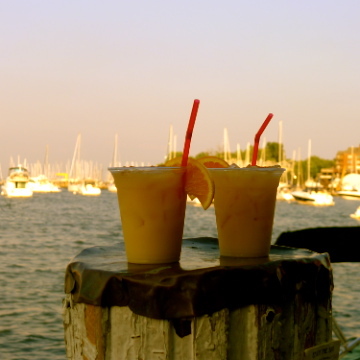 You certainly shed some light on the topic that is currently getting the expat community in a frenzy. I think what turned me off from this book (besides the fact that I don't have children) is how the author captures the audience with a generalization, implying that French children are superior, more polite and are more aware of other people. Now that I've learned that the book is more of a memoir that a cultural study certainly changes my opinion. Who am I to rob her of her experiences, even if I don't agree with all of her observations. I think that what turned you off of the book is exactly what turned a lot of people off of it, especially those people whose children have gone through the French educational system. I frequently hear reports of how abusive French children can be to their peers, so I truly don't think that their way is superior. Having said that, I'm always ready to learn from other cultures and adapt the things that make sense to me. I also think that some of the older expats, many of whom have French spouses, were upset because here was a young usurper (married to an Englishman) with young children talking like an expert on how the French raise their children. Since I wanted to know if Mrs. Druckerman presented her book any differently in the USA than she did in Paris, I watched the Today Show clip afterwards. I'm so happy that I didn't see it first because the beret was a real turnoff. I wonder if it was her publicist's idea. I promise! My hair is too big. I look like an idiot in a beret. For some reason Weird Al Yankovic is coming to mind...hmm. Great reporting, almost makes me want to....read the book (not have a baby). I wonder what filing system, shelving system the American Library uses--Library of Congress or the old fashioned Dewey Decimal. Yes, the book is an interesting read from a sociological standpoint - there's no way that I would want to have a baby now! You used to volunteer in a library, didn't you? The American Library uses the Dewey Decimal System. I plan to write a post on the library in the near future. It has had an interesting history and provides a useful service to community. An interesting discussion... I don't see why it's such a big thing, though, that kids eat vegetables? Or say hello and thank you and please? Isn't that normal behaviour everywhere in the world?! I had no problem teaching my Swiss kids these basics, unfortunately I struggled more with putting them on a strict schedule and therefore "learning" to sleep through the nights took them far too long. Well, all of this is in the distant past, thank goodness! I heard about the book on BBC Women's Hour before it came out in the US. For me it reveals much about underlying French culture in addition to clues to French parenting. Isn't 'la formule' served in restaurants just another version of the lunches at the creche? I've seen French women eating rich desserts in the afternoon but I didn't realize that was their one snack of the day. There are many lecons in the book I respond to. Druckerman did her homework. There's plenty of footnotes and statistics. In the end it was a very funny and informative read for me. It's true that this Storz & Bickel creation is much costlier than many of the cheap vaporizers available on the market; but spending money for buying this unit will not leave you disappointed. You can easily shop around the Internet and while doing so you can look for reviews on the various models you may be considering. When this has dried, lay twigs across the top and glue them to the frame. aware of fact that with proper combination of health and right living style you can attain the best possible. as possible. You might not like one or the other one would be your favourite. essence of smoking but in a much safer way and this is only possible with herbs. to different world of Aromatherapy. or pets they may try to play in, or drink from, the water bowl. dry mucous membranes and the discomfort our pets endure.